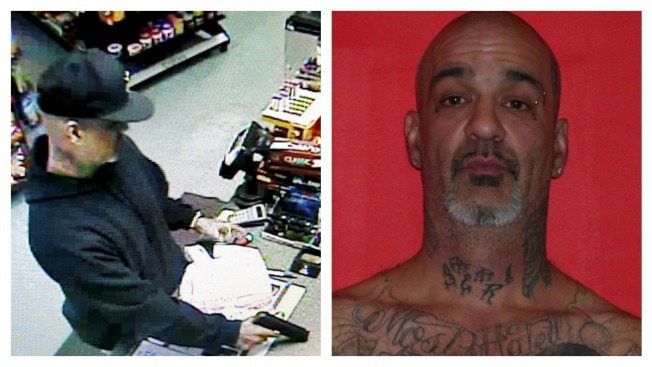 Police are seeking alleged gang member Ryan Cheney in connection with an armed robbery at a local gas station and convenience store. Police in Tilton, New Hampshire, are searching for an "armed and dangerous" gang member in connection with a robbery that occurred on Thursday night. Tilton Police said they received a 911 call reporting an armed robbery at the Tilton Shop Express at 622 Laconia Rd., at 7:25 p.m. Thursday. A male suspect dressed in black, wearing a black ball cap, allegedly pointed a black handgun at the clerk and demanded all of the cash in the register. When police arrived, the suspect was already gone, but they were able to determine his identity using store security cameras. Arrest warrants were issued Friday morning for Ryan Cheney, 40, of Laconia, charging him with armed robbery. He was already wanted before the robbery on unrelated arrest warrants. Police said Cheney is a member of the Latin Kings Gang and should be considered armed and dangerous. The vehicle used in the robbery - a red 2001 Ford Expedition - has been recovered by police and is being processed. Anyone with information about Cheney's whereabouts is asked to call Tilton Police at 603-286-4442.